The scale and pay-as-you-go paradigm of modern cloud platforms like Amazon Web Services (AWS) have antiquated the traditional approach of analyzing costs. Site24x7 CloudSpend can help you manage AWS costs across your entire organization, so you get the most value out of every dollar spent. Everything you need to analyze and understand your AWS costs in a single place. Our handcrafted parser automatically ingests and processes the raw AWS Cost and Usage report data files and extracts all the relevant data fields—a unique combination of service, usage type, pricing unit, operation, and more—to provide an up-to-date view of your AWS costs to the last dollar. Before you start optimizing, you need to understand when and where you're accruing costs. 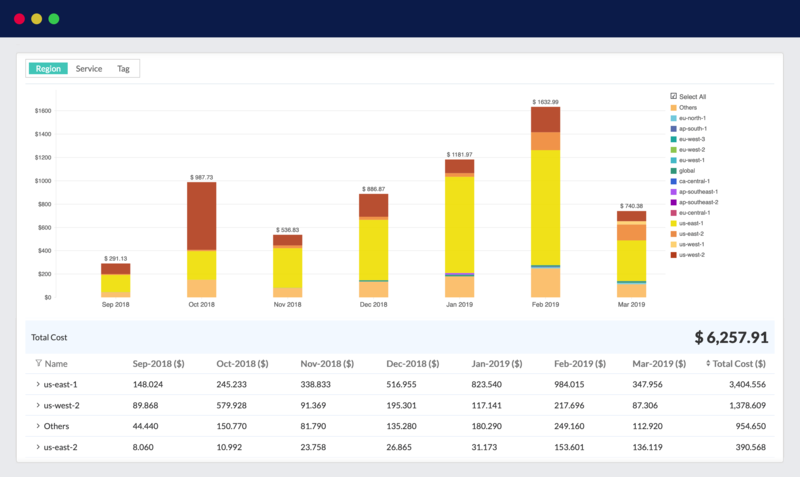 Identify the top three cost accruing services; see running costs for the past six months as well as month-to-date costs; and view distribution of costs by region, instance-type, component, data transfer, and more. Perform ad-hoc analyses using various filtering and grouping dimensions. Break down spending by linked accounts while setting up your own dates or choosing from a predefined date range to segment data by time. Alternatively, you can use AWS-generated and user-defined tags to isolate and analyze subsets of your cloud costs. Tags are a great way to organize resources in your AWS account. 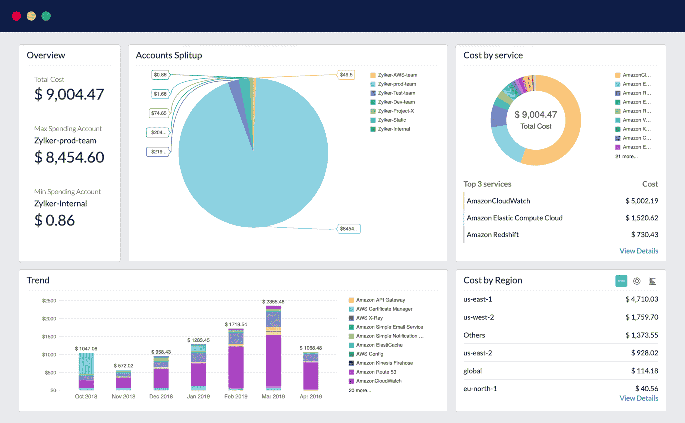 With Site24x7 CloudSpend, both account holders and AWS Managed Service Partners (MSPs) can leverage this custom metadata to allocate spending to one or more business units to track costs for different teams, projects, and customers. For example, you can account for the AWS services consumed during the testing, development, and production of a new app. Simplified budget creation workflows remove surprises and let you stay on top of your infrastructure expenses with ease. Set up monthly, quarterly, or annual targets for your linked accounts or business units, and get email notifications when your actual costs exceed the budgeted amount. Managing AWS costs is just one part of driving operational excellence. To run your business smoothly, you need comprehensive insight into your environment—from the front end to the infrastructure layer. Combine our existing full stack monitoring capabilities with CloudSpend to gain more visibility and control over how you use AWS services.